This week’s theme on the I Heart Faces photography challenge is yellow. I truly love yellow – I think it’s my favourite colour. I wanted to post this picture so I could play along. I’ve been following I Heart Faces forever, but this is my first submission — yay! Edited to add: Wheeeee!! I won!! Well, actually, I came in second place, but with nearly 450 amazing entries, I’m pretty happy with that. WOW! This is an amazing picture!!! Oh my goodness, I LOVE this shot!!! Great freeze of action, composition, reflection and all around great capture!!! This is so awesome! I love the moment, the color, everything! Love this! A great capture in the moment, makes me want to join him! First I want to tell you how much I love this shot…you have caught it at just the right split second and the framing is erfect too! 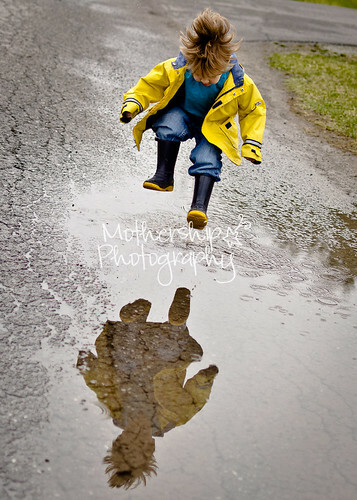 Love it…kids and puddles…there are few things better…I used to let my guys go in their wellies and diapers and stomp to their hearts content! It is funny how in this huge, seemingly limitless WWW, there are times when the world seems actually small…that you can bump into an almost neighbour! Love this! The reflection is perfect! Hmmm…I didn’t mean for my comment above to be an anonymous one! Oh my gosh! I LOVE this one! It makes me want to run out and splash a puddle myself! It’s so sharp and the timing & composition are perfect! Nice work! Oh I just love everything about this shot. I love this photo! It captures the moment perfectly. I’m supposed to be studying, but I keep sneaking back to look at I heart Faces photos. Saw yours and just had to let you know its my favorite of the bunch!! If you dont get mentioned, let me know and I’ll make my own button for you!! omigosh !! this is SO cute !! definitely one of my favorites i’ve seen this week 😀 LOVE it ! This is great! You will definitely be highlighted this week! That’s a fantastic shot. I love everything about it: the colors, the action, the joy, the reflection in the puddle. I can almost see and feel the puddle splashing all over the place. Sweet & cool photo! This is my FAVORITE! Congratulations on your win at I heart faces. So exciting since it is your very first time entering. Awesome! Congratulations on coming in 2nd! That’s quite the accomplishment! I don’t know where to begin, I love everything about this picture! The colors, the reflection, the motion, just EVERYTHING. Click the photo to view it on Flickr, or for more information about custom family portrait photography,please visit my Mothership Photography site. Welcome and thanks for stopping by! Hi, I’m Danielle Donders, but my friends call me Dani, and the Internet calls me DaniGirl. I'm a Canadian photographer, blogger, government social media strategist and mom to three boys. Everything else you need to know - and a whole lot more! - is in the blog. ahmer: That’s a quite fantastic day..! DaniGirl: Ah yes, Harry Potter and Star Wars both at Orlando. We need to go!! DaniGirl: It was really good, and we’ll have pork tacos tonight and STILL have some leftovers! DaniGirl: Hi Mark, I’d say it’s about half a kilometer or so. Mark Harris: Hi – looks like a great place. How long is the boardwalk section? Photo fun: Make it snow! Photos of the day: Red hot chili peppers! Photo of the day: 50 things about me! 2018-04-20 No articles on this date. Did I mention I like photography? This was good, but not great. I enjoyed reading it, but I liked the set up and story far more than the denouement. My least favourite of the Anne books so far. I could feel the boys' attention wandering as odd and quirky characters wandered in and out of the narrative. Any book with Anne Shirley in it is a wonderful story by default, though. I liked this book, but I didn't love it. I couldn't warm up entirely to any of the characters, though the plot was interesting enough to be engaging. A good read, not a great one. The ending of this book made me regret the time I invested in the series. Thesis WordPress Theme powered by Wordpress, customized by ME! All content copyright 2005-2013 Danielle Donders.